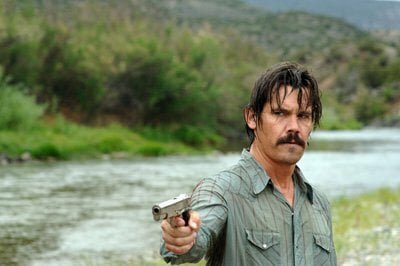 While hunting antelope in the desert along the Rio Grande border, Llewelyn Moss (Josh Brolin) stumbles upon the fresh carnage of a drug deal gone bad. Although the ground is littered with lots of bullet-riddled corpses and one badly-wounded Mexican, the intrepid Vietnam veteran wanders rights into the crime scene and pokes around, finding a pickup packed with heroin and a suitcase containing two million dollars. Seizing the satchel, Llewelyn rushes home to share the windfall with his wife, Carla Jean (Kelly Macdonald). But later, his conscience gets the better of him, and he makes the ill-advised decision to return to the prairie to check on the condition of the gun battle’s sole survivor, only to end-up almost caught in an ambush by some gangsters looking for the loot. Because Llewelyn has to make his escape on foot, he knows that it’s just a matter of time before both the crooks and the authorities trace the truck he left behind back to him. Out of concern for his wife’s safety, he sends her out of town to stay with his mother-in-law until the smoke clears, while he braces himself for the fallout certain to ensue. Also aware of the botched operation is Anton Chigurh (Javier Bardem), a sadistic sociopath who clearly has no compunction about eliminating anyone standing between him and the money. At the point of departure, we find this unsavory character in police custody, though he soon strangles a deputy and makes his break in the officer’s patrol car. 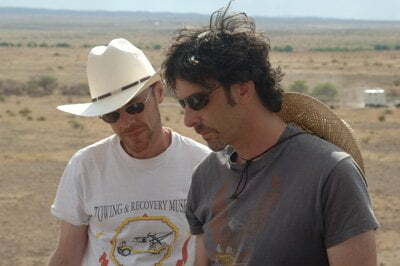 With Anton now hot on the trail of Llewelyn, close to retiring Sheriff Bell (Tommy Lee Jones) soon joins the chase. He’s bothered by the fact that a sadist with a penchant for torture is on a grisly killing spree, so he wants to crack this onelast case before quietly slipping off into the sunset. But as the attrition-rate continues to mount, it becomes clear that despite all their experience, the elusive outdoorsman Llewelyn and the seasoned lawman Bell are up against more than they bargained for in the trigger-happy hit man. What ensues is a nerve-wracking cat-and-mouse caper guaranteed to keep you on edge for the duration. 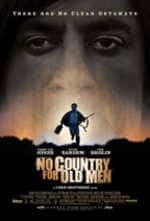 Based on Cormac McCarthy’s best seller of the same name, No Country for Old Men is a messy, modern-day Western overlaid with elements of a psychological thriller. As adapted by Ethan and Joel Coen, the generally claustrophobic whodunit curiously unfolds against the visually-expansive backdrop offered by some sumptuous, big sky panoramas. Nonetheless, what makes the film memorable is the trio of powerful performances turned in by its three principals. Javier Bardem steals the show as perhaps the most unnerving screen villain of the year, a monster who ups the ante in terms of tension by holding a cattle gun to his victims’ heads while flipping a coin to determine who lives and who dies. Almost as engaging are Tommy Lee Jones’ relatively-reflective, aging gunslinger eager to get out of the game, and Josh Brolin’s morally-compromised rogue on the run enveloped in a harrowing existential Hell. Expect this flick to be remembered at Oscar time, in spite of an enigmatic ending reminiscent of Blow Up.